The info will be copied and pasted into the design, so please be certain of spelling and punctuation. 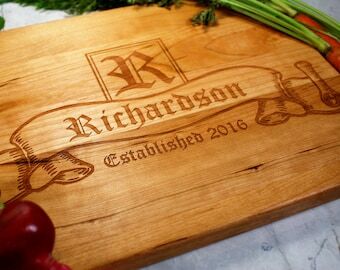 Our high quality wood cutting boards are precision cut and hand sanded. 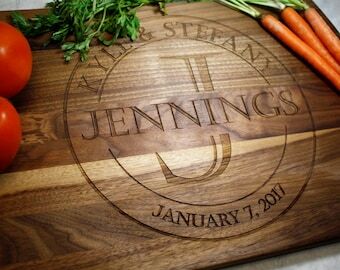 Whether you're looking to add to your kitchen home decor, give a gift to a significant other or friend, or just looking for something creative, our personalized cutting boards and other products make a great gifts and unforgettable wedding gifts! ****Choose from three high quality types of wood - maple, walnut, and cherry. Please, provide the following information in the "Add Your Personalization" box. Display Stand - A wooden stand specifically chosen for whichever size board you purchase to proudly display it when not in use. Cutting Board Oil - An 8oz bottle of our special blend of food grade oils, minerals, and bees wax to give your board that amazing shine while strengthening, protecting, and adding years to the life of your board. We recommend reapplying oil to your board every 5-7 washes. Gift Box - A must have if you're giving or sending this board as a gift. We wrap your board in elegant white wrapping paper and add an adorable blue bow which matches the fun blue filler which helps protect your board in transit as well as providing an amazing presentation for the recipient. 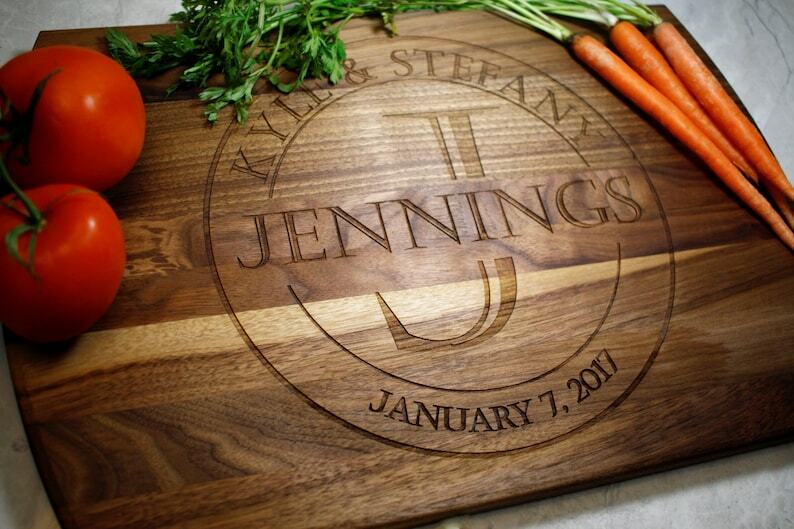 Add the oil and display stand for an unforgettable gifting experience! The information will be copied and pasted into the design, therefore, provide exactly what you want to see on the board. We will not be guessing the spelling, single/ plural forms, commas, apostrophe and other punctuation use. It is VERY IMPORTANT to double check names/dates that you submit to us. We can not accept returns, as it is a customized product, unless the error was made on our end. 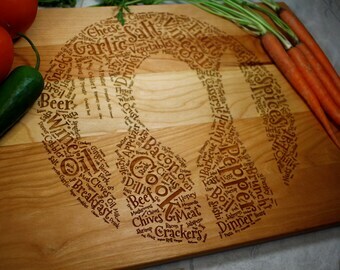 Please be aware that every cutting board is different and the color of wood may vary from the picture! 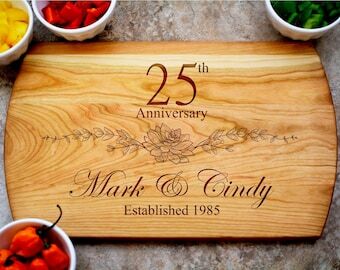 Our boards are made from natural wood, we do not stain or paint our boards. 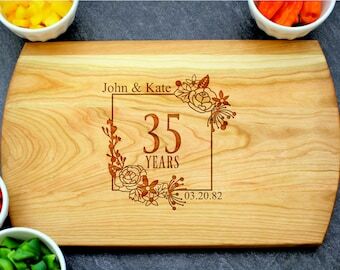 Some boards may engrave slightly lighter or darker than the photo shows. Our boards include a bottle of Blue Ridge Mountain Gifts Cutting Board Conditioner so you can treat your new board to protect it. We recommend treating it after each use or every 2 weeks. We recommend cutting on the non-engraved side for easy cleaning purposes. We purchased this item as a 25th wedding anniversary gift. It was a perfect memento of the occasion. It was so good looking, the recipients couldn't decide if they wanted to display or use it! Email us at info@blueridgemountaingifts.com for more information on wholesale conditions and pricing.